Hāfiz-i Šīrāzī (Persice nomine pleno خواجه شمس الدین محمّد حافظ شیرازی Khwāja Šams al-Dīn Muhammad Hāfiz-i Šīrāzī), nomine litterario Hāfez (1325/1326–1389/1390), fuit poeta lyricus Persicus. Sua opera conlecta, ex ordinibus poesis Persicae (divan) composita, in domibus plurimorum qui Persica utuntur in Irania et Afgania inveniuntur, qui usque hodie eius poemata memoria tenent et pro proverbiis et dictis adhibent. Sua vita et poemata fuerunt res multarum explicationum, commentariorum, et interpretationum, litteras Persicas plus quam scripturae aliorum auctorum adficientia. Divan Hafezianum, miniatura Persica, 1585. Sepulcrum Hafezianum in vico Shiraz in Irania. ↑ Yarshater. Accessum 25 Iulii 2010. ↑ Hafiz and the Place of Iranian Culture in the World, ab Aga Khan III, Londinii, 9 Novembris 1936. Avery, Peter. 2007. The Collected Lyrics of Hafiz of Shiraz. Cantabrigiae: Archetype ISBN 1-901383-09-1. Browne, E. G. 1998. Literary History of Persia. 4 voll. ISBN 0-7007-0406-X. Durant, Will. 1957. The Reformation. Novi Eboraci: Simon and Schuster. Erkinov, A. 2002. Manuscripts of the works by classical Persian authors (Hāfiz, Jāmī, Bīdil): Quantitative Analysis of 17th-19th c. Central Asian Copies. Iran: Questions et connaissances. Actes du IVe Congrès Européen des études iraniennes organisé par la Societas Iranologica Europaea, Paris, 6-10 Septembris 1999. Vol. II: Périodes médiévale et moderne. Cahiers de Studia Iranica. 26, ed. M. Szuppe. Lutetiae et Lugduni Bataviorum: Association pour l`avancement des études iraniennes-Peeters Press. Hafez. 1995. The Green Sea of Heaven: Fifty ghazals from the Diwan of Hafiz. Conv. Elizabeth T. Gray, Jr. White Cloud Press. ISBN 1-883991-06-4. Hafiz. 2007. Divan-i-Hafiz. Conv. Henry Wiberforce-Clarke. Ibex Publishers. ISBN 0-936347-80-5. Hafez. 2008. The Angels Knocking on the Tavern Door: Thirty Poems of Hafez. Conv. Robert Bly et Leonard Lewisohn. HarperCollins. ISBN 978-0-06-113883-6. 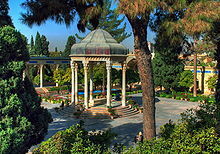 Khorramshahi, Bahaʾ-al-Din (2002). "Hafez II: Life and Times"
Rypka, Jan. 1968. History of Iranian Literature. Reidel Publishing Company. ISBN 90-277-0143-1. Yarshater, Ehsan (2002). "Hafez I: An Overview"
Vicimedia Communia plura habent quae ad Hafiz spectant.